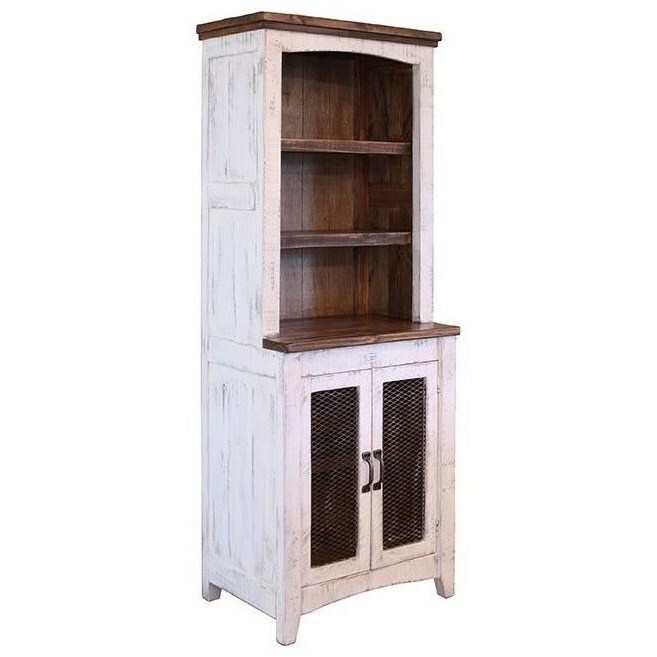 Enhance any room in your home with this pier's versatile storage and style. Thanks to its distressed, two-toned finish and its mesh metal door fronts, this piece is sure to look just as good in your living room as it does in your kitchen or anywhere else in your decor that you want a warm, rustic look. Plus, this pier has open storage in its top and concealed storage in its base, giving you the perfect place for display as well as the perfect place to tuck things away. The Pueblo Rustic Universal Pier with Mesh Metal Door Fronts by International Furniture Direct at Sam Levitz Furniture in the Tucson, Oro Valley, Marana, Vail, and Green Valley, AZ area. Product availability may vary. Contact us for the most current availability on this product. The Pueblo collection is a great option if you are looking for Transitional furniture in the Tucson, Oro Valley, Marana, Vail, and Green Valley, AZ area. Browse other items in the Pueblo collection from Sam Levitz Furniture in the Tucson, Oro Valley, Marana, Vail, and Green Valley, AZ area.